…and here is the chicken gyro close-up. A little side about the spot, it is a very small stand alone joint and seating can get limited. It has an old fashioned burger joint vibe, but not like “neon lights” kind of thing. It homely. Service was ok; it was your typical teenager service, but minus the attitude. Anyways, as for the food, it was delicious. I can’t speak to much for the steak sandwich since it wasn’t my order, but as you can see, it was an actual piece of steak. 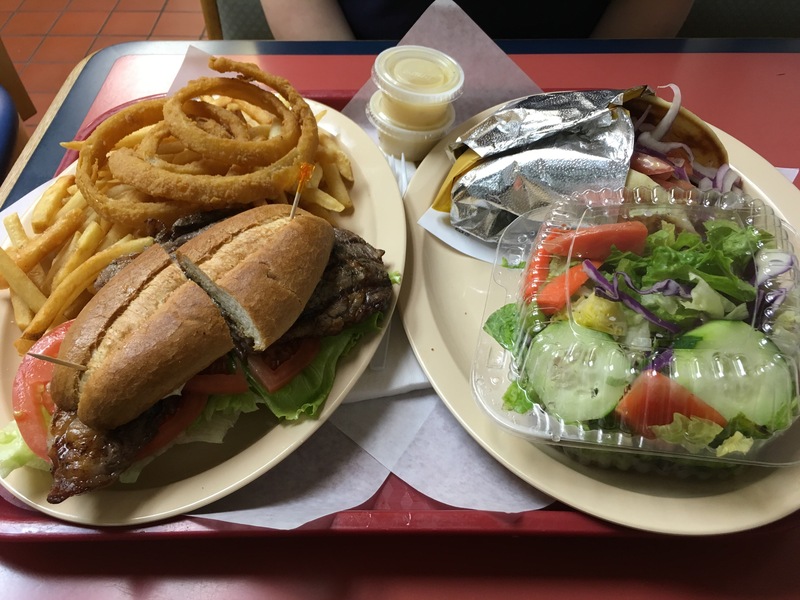 Most times when I order a steak sandwich is filled with a pile of thin sliced beef, so it was a pleasant surprise to see an actual piece of steak. Now for the chicken gyro, I enjoyed it very much. It was a little on the dry side (I actually like my chicken a little dry, but thought you should know). The sauce it comes with on the side should fix that though, which by the way was also tasty and I believe it was a cucumber Greek yogurt type. Nothing crazy about this gyro though, it had the essential and that’s all it needed. I know there is no burger here and the place happens to be call Burgertown, but I think that shows this little spots versatility. You’ll most likely find something on the menu that you’ll enjoy…and it might not be a burger.